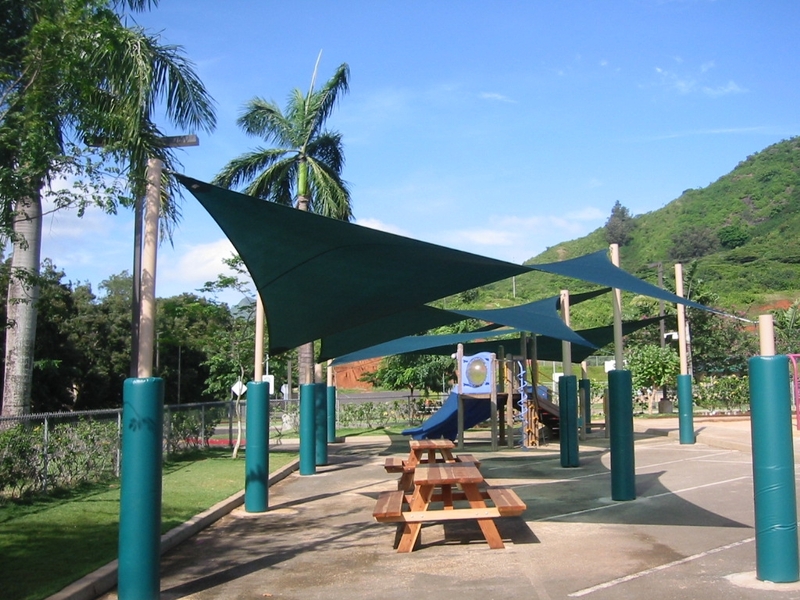 Shade Sails may have up to a 30′ longest edge on a triangle or 40′ longest edge on a quadrilateral. Larger sails are possible but only with proper design/engineering and patterning. Engineering services, computer patterning, and special high strength fabrics are available. A cable to a remote attachment point may extend one corner; otherwise the corners should be fixed directly to a post or an adequate fixing point. Use of extending cables allows the membrane to move too much which increases shock loading and reduces membrane life expectancy. flat sails more slope is even more imperative. Failure to have enough slope will cause puddling and excessive sag which can cause a membrane to fail. imparts a 3rd dimension of tension into the membrane. Another way to get this 3rd dimension is to have one corner of the quadrilateral much higher then the other corners. (High Point Sail) Membranes with 3 dimensions and are not relying on just edge tension, have a more even distribution of forces. Flat 2 dimensional sails tend to concentrate forces at the corners and edges, A Shade Sail is only as strong as its weakest point. Therefore, a flat 2 dimensional sail is not as strong as a 3 dimensional form and will not last as long when exposed to the same conditions. Sails should not be allowed to stay up in the event of snow. Long-term loading will stretch the fabric. Shade Sails do not shed snow well. Overlapping sails should have a minimum of 18” of separation to avoid chafe. Movement in high winds can cause close sails to touch and they will suffer chafe damage in a very short time. It is the installer’s responsibility to understand and follow these rules and recommendations. When these rules are not followed then any warranty given or implied by Shade Sails LLC becomes void.